Have you ever experienced pain in your wrist area with pins and needles radiating to your fingers? Does your palm or any of your fingers feel numb? Does your grip weaken and the skin on your thumb or finger suddenly becomes dry? Chances are you have carpal tunnel syndrome. 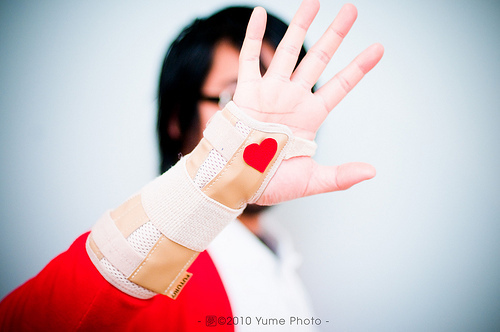 Who are prone to Carpal Tunnel Syndrome? The condition can affect just any one of us but pregnant women, obese people, people with arthritis, women between 40 and 60 years and those with jobs involving the hands and wrists are prone to developing the condition. It is also believed that carpal tunnel syndrome runs in families. The condition also occurs equally for both men and women in their late 70s. The disease occurs when the pressure inside the “tunnel” containing the median nerve, tendons and other structures are compressed due to increased pressure secondary to swelling, water retention, cyst formation or any abnormal growth. The compression leads to restriction in blood supply brought about by the median nerve. This causes pain, weakness, numbness, pins and needles and muscle atrophy to the thumb, index, middle finger and a small part of the ring finger. Sometimes, the pain radiates up to the shoulder. A simple test is the Phalen’s maneuver. To perform this, just press the back of your hands together and maintain the position for 60 seconds. A positive sign elicits pain and tingling sensation in the palm and fingers. Another test called the reverse Phalen’s maneuver assumes a prayer position with both palms pressed together. The condition can be treated conservatively or surgically. For non-surgical treatments, usually rest of the affected area is advised. NSAIDs, local anesthesia or corticosteroid injections are given to relieve pain. Splint is prescribed to be worn at night. If the condition is due to fluid retention, diuretics may be prescribed too. To help relieve pain, restore motion and maintain musculo-skeletal structures, physiotherapy is also recommended. Surgery, on the other hand, is recommended for those who experience the condition long term. An incision of about 5 cm is made in the palm and sometimes extending to the wrist. Carpal tunnel release is then performed. It would take around four weeks rest to recover from surgery. Fortunately, doctors from Apollo Specialty Hospital in Chennai, India developed a new endoscopic technique that lessens the incision needed during carpal tunnel release. The technique, which was introduced by Dr. G.B. Rajan, aims to lessen the hospital stay and recovery period of the patient. With the new endoscopic technique, patients only need to rest for a maximum of eight days after surgery then they can assume normal daily activities. The procedure is performed with the aid of an optically linked video monitor to help the surgeon with the incision. The procedure only needs to cut less than a centimeter incision along the skin crease in the wrist. Only mild sedation is needed, with the procedure lasting for only around 30 minutes.